Combine all ingredients. 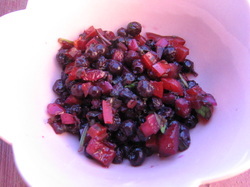 Fold in wild blueberries last. Refrigerate 1 hour or more to blend flavors. Serve with organic corn chips or use as a relish with meat and poultry dishes.